As political upheavals continue in the Middle East, the Philippines peaceful revolt in 1986 that toppled a dictator becomes more significant to the world. As national elections in neighboring countries in Southeast Asia grapple with uncertainties, the political stability in the Philippines under a Liberal President gets more attention. However, with the issues of drug mules and smuggling, which are questions of human rights and trade, can the Philippines really say that it champions democracy? These will be discussed as People Power veterans, government leaders, academicians, and the media come together for a forum series entitled Road to Manila: Shifting Gears for Democracy. Three forums are scheduled on May 19, May 26 and June 1 to analyze the influence of Philippine democracy in the wave of demonstrations in the Middle East, and the country’s role as a democracy anchor in Southeast Asia. Sec. Leila de Lima of the Department of Justice (DOJ), Prof. Felipe Medalla of the Foundation for Economic Freedom (FEF), and Former Senator Wigberto Tanada will answer how human rights and trade can be reconciled. Click here for the full schedule. “Human rights and free trade are pillars of liberal democracy. The Philippines, under a Liberal Government, should ensure that economic growth is achieved but not at the expense of human rights,” said Jules Maaten, Country Director of the Friedrich Naumann Foundation for Liberty (FNF). "I am also delighted that FNF Regional Director Dr. Rainer Adam will also contribute to this series of debates when we discuss the prospects of Asian democracy," he added. FNF organizes the forums together with the Council of Asian Liberals and Democrats (CALD), National Institute for Policy Studies (NIPS), Ateneo Human Rights Center (AHRC), and De La Salle University (DLSU). 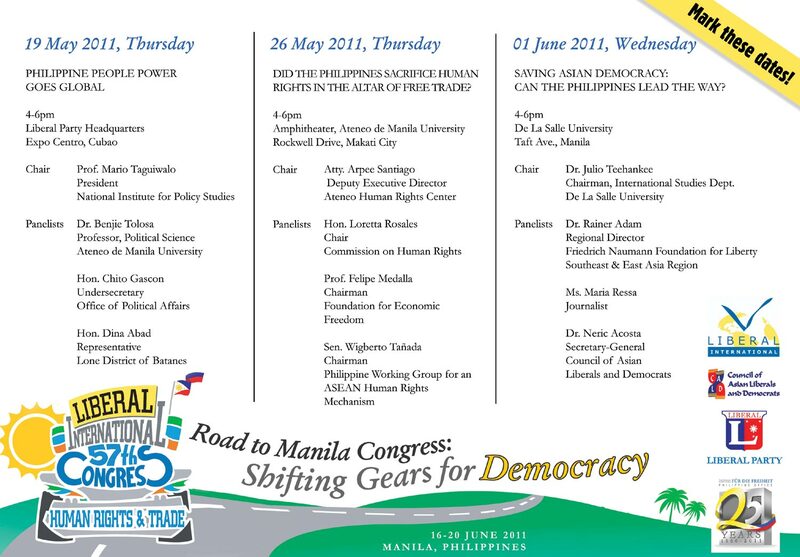 The series of activities is in the run-up to the Liberal International (LI) 57th Congress in Manila on June 16-20, 2011 where 300 liberals from all over the world are expected to attend.